With the availability of open, accessible content, shared by others using a Creative Commons License is one way to find and use resources that would not otherwise be available. Knowing the difference in the licensing agreements will provide you with the security that YOU will be recognized as the ‘author’ of your own work. By reviewing information about creative commons licensing options, you can determine how and where you can use and share materials created by others. This can also apply when you want to declare ownership of your own digital creations. Watch this video about the Creative Commons Culture to learn more about sharing and creating on the internet. To learn more, begin by viewing the animated video about Creative Commons. 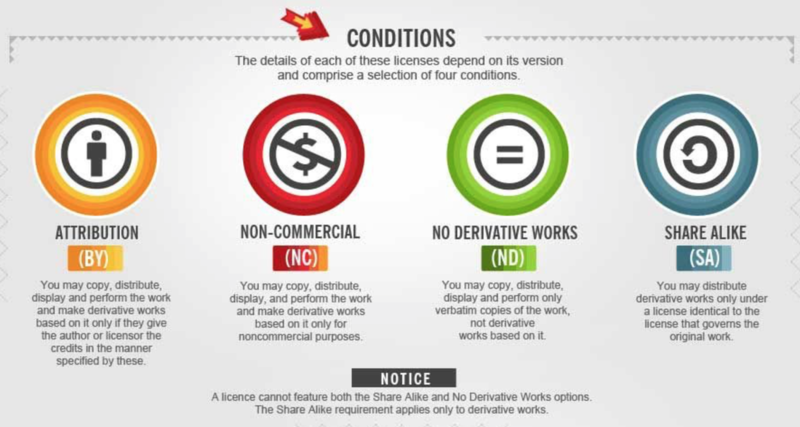 Creative Commons licensing sets out a structure in how works are shared on the internet. YOU can decide how to share your work - Your DIGITAL SELF PORTRAIT for example. Examine the conditions under which you would like to share your work. Then got to the Creative Commons choose your own license site to build an image/tag to apply to your Digital Self Portrait Blog. Creating your own creative commons license for images or authorship.